Even though we’re getting three Ravnica sets in this release year, it’s not technically considered a block. If one stand-alone set under the new model fills the role of a block in the old model, we can refer to Ravnica’s rulership over Standard as “five-time, five-time, five-time, five-time, five-time!” Well, I will, anyway. I’m kind of glad convoke is coming back as the Selesnya signature mechanic. I think it fits their theme just as well as populate does, but it has an important upside: have you ever run out of stuff to use as tokens once you started slinging populate cards around? I have. It’s frustrating. Convoke is a great mechanic all around – it lets you ambush people with surprises ranging from Giant Growth effects to Oblivion Ring effects (or so I hear), and even if you don’t actually have the relevant cards in your deck, any opponent who’s read spoilers will see your colors and start worrying about what cards you could cast by using your creatures to pay for part of them. Nowadays, when we see a lot of green mana and a lot of creatures with comes-into-play abilities, we often expect Chord of Calling. But this is still one of the best instants to pull out at the end of an opponent’s turn – knowing it’s a threat doesn’t automatically mean you can stop it, and a deck that has counterspells will always have to fear it as there are so many creatures you can Chord for that will simply change a game. That’s because it has no color restriction like its famous iteration, Green Sun’s Zenith, and it equally finds Ohran Viper to pressure control and Sunblast Angel to devastate small creature strategies. I’ll go out on a limb and say that even though it requires some thought and deckbuilding dedication, it is one of the most powerful green cards of all time. This is usually the part of a review where I say something like “Why doesn’t this come back to Standard for another run?”, but I’m not sure all of you guys would be happy about that. Someone would undoubtedly find a way to Chord for Goblin Chainwhirler! The upcoming Guilds of Ravnica gave me the idea to revisit some old gems from the first block set on the second most-visited plane of allll tiiiiime, and so we’re going to do that this week! Selesnya is the first guild we’re revisiting, and their guild mechanic is the only one out of the 10 possible candidates tabbed for a return in Guilds of Ravnica. Convoke has shown up in a core set (Magic 2015), and it’s a nicely intuitive mechanic: your creatures help you cast spells. The wording was changed from cost reduction to actually paying for the spell, which helps with interactions like with the infamous Trinisphere. And given that green, white, and green and white together like to go wide, convoke pairs well with the natural inclinations of the strategy. 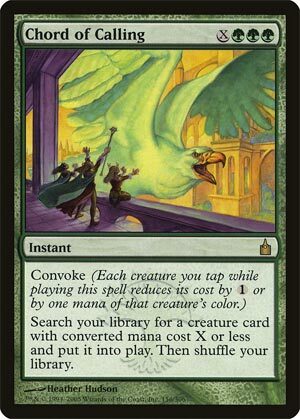 Speaking of that, Chord of Calling is probably the flagship card of convoke; if it’s not the most powerful card with the ability, it’s up there! It lets you tutor at instant speed for any creature with converted mana cost X or less; instant-speed allows it to function as a potent combo piece and enabler, and it can even be as simple as putting out a creature to attack with on your next turn. It was a Standard staple both times it was in the format, and it shows up in Modern from time to time. Definitely a card to be mindful of, and worth at least mild consideration if you’re in green.